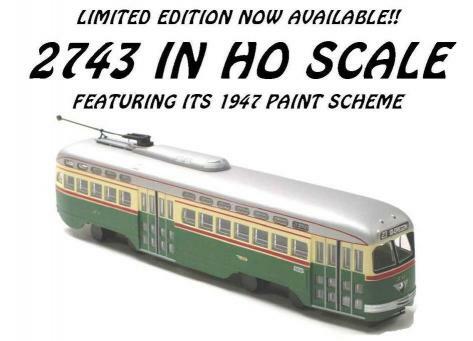 A VERY LIMITED NUMBER of Bowser HO Non Powered Display Models of PCC 2743 in its as-delivered paint scheme are now available. This scheme is green and cream with a silver roof and the maroon belt rail and pin striping. The destination sign is Route 23 10-Oregon and is correct for Route 23 in 1947 where this series of PCCs were first in operation on the streets of Philadelphia.